Do you have any special instructions you wish to include? If you have other concerns about the kind of treatment you will be given when you can no longer direct your own health care, you may add directives in your own words below. You do not have to add more directives if you do not want to. e.g. I direct that I shall not receive blood transfusions on the basis of my religious beliefs. When should I include special instructions?Including special instructions is completely optional, but if you have any unique circumstances or preferences you may want to mention them. For example, if your religious beliefs prohibit blood transfusions.What types of instructions are not allowed?Any instructions that don't directly deal with your health care treatment while you are alive should be avoided. After you complete this document we will show you the appropriate forms for handling any additional estate/financial planningHow do I draft a clause in plain English?Plain English means language that is simple and conveys ideas with the greatest possible clarity and avoids using legalese. How should I write my instructions? (a) Each instruction starts with the phrase "I direct that". (b) Write clearly and in full sentences to avoid ambiguity. (c) Do not abbreviate words. (d) Try to limit one instruction to each paragraph. I, _________________________, of ____________________________, ______________________________, Virginia, being of sound mind, voluntarily create this Appointment of Health Care Agent. I revoke any prior Appointment of Health Care Agent. Full power to sign any documents required to request, withdraw, or refuse treatment or to be released or transferred to another medical facility. My agent does not have authority to act for me for any other purpose unrelated to my health care. All of my agent's actions under this power during any period when I am unable to make or communicate health care decisions have the same effect on my heirs, devisees and personal representatives as if I were competent and acting for myself. The designation of my health care agent will become effective on my inability to make or communicate health care decisions as determined by my attending physician and will remain in effect until my death, or until I regain competence and revoke it. My agent will make health care decisions for me in accordance with this document, and in accordance with any instructions I give in a Living Will, Health Care Directive or other such document (either included in this document or as a separate document), and my other wishes to the extent known to my agent. To the extent my wishes are unknown, my agent will make health care decisions for me in accordance with what my agent determines to be in my best interest. In determining my best interest, my agent will consider my personal values to the extent known to my agent. A copy of this Appointment of Health Care Agent has the same effect as the original. If any part or parts of this Appointment of Health Care Agent is found to be invalid or illegal under applicable law by a court of competent jurisdiction, the invalidity or illegality of such part or parts shall not in any way affect the remaining parts, and this document shall be construed as though the invalid or illegal part or parts had never been included herein. But if the intent of this Appointment of Health Care Agent would be defeated by such construction, then it shall not be so construed. This Appointment of Health Care Agent is made after careful reflection, while I am of sound mind. I am fully informed as to all contents of this document and understand the full import of this grant of powers to my agent. I fully understand that by signing this document, I will permit my agent to make health care decisions for me. I understand that my signature on this document gives my agent authority to provide, withhold, or withdraw consent to health care treatments or procedures on my behalf; to apply for public benefits to defray the cost of my health care; and to authorize my admission to or transfer from a health care facility. I further affirm that I am not signing this document as a condition of treatment or admission to a health care facility. I, the undersigned witness, declare that _________________________, the person who signed this document, is personally known to me and appears to be of sound mind and acting of her own free will and under no duress. She signed (or asked another to sign for her) this document in my presence. I further declare that I am at least 18 years of age, I am not entitled to any portion of _________________________'s estate, not financially responsible for _________________________'s health care, not named as _________________________'s health care Agent in this document, and that I am not married to _________________________ and not related to _________________________ by blood or adoption. If I, _________________________, become incapacitated and am unable to direct my health care providers as to my own health care, I direct that this statement be read as a true reflection of my health care wishes. "Artificially administered food and water" (or artificial nutrition and hydration) means the provision of nutrients or fluids by a tube inserted in vein, under the skin in the subcutaneous tissues, or in the stomach (gastrointestinal tract). "Attending physician" means the physician licensed by the state board of medicine, selected by or assigned to the patient, and who has primary responsibility for the treatment and care of the patient. "Comfort care" means treatment, including prescription medication, provided to the patient for the sole purpose of alleviating pain. Artificially administered food and water is not included. "Health care provider" or "provider" means any person licensed, certified, or otherwise authorized by law to administer health care in the ordinary course of business or practice of a profession. "Irreversible (Permanent) Coma" means a profound state of unconsciousness caused by disease, injury, poison, or other means and for which it has been determined that there exists no reasonable expectation of regaining consciousness. "Life-prolonging procedure" (or "life-sustaining procedure") means any medical procedure, treatment, or intervention which sustains, restores, or supplants a spontaneous vital function. In this document the term does not include sustenance and hydration administration, or the provision of medication or the performance of medical procedure, when such medication or procedure is deemed necessary to provide comfort care or to alleviate pain. a. The absence of voluntary action or cognitive behavior of any kind. b. An inability to communicate or interact purposefully with the environment. "Terminal condition" means a condition caused by injury, disease, or illness from which there is no reasonable medical probability of recovery and which, without treatment, can be expected to cause death. I be kept on any artificial life support as long as possible within the limits of generally accepted health care standards. I be artificially administered food and water, even if that has the effect of prolonging my life. I be provided comfort care, and relief from pain, including any pain reduction medication, even if doing so would prolong my life. Notwithstanding my other directions, if I am known to be pregnant, I do not want life-sustaining treatment, artificially provided nourishment or fluids and comfort care treatment, to be withheld or withdrawn if it is possible that the embryo/fetus will develop to the point of live birth with their continued application. I have no additional instructions. I understand that I may change the above-listed directives at any time by revoking this declaration and writing a new one. A copy of this Advance Medical Directive has the same effect as the original. If any part or parts of this Advance Medical Directive is found to be invalid or illegal under applicable law by a court of competent jurisdiction, the invalidity or illegality of such part or parts shall not in any way affect the remaining parts, and this document shall be construed as though the invalid or illegal part or parts had never been included herein. But if the intent of this Advance Medical Directive would be defeated by such construction, then it shall not be so construed. This document is made upon careful reflection. Options that I have considered and rejected are not printed above. I confirm that the health care directions contained herein were made after careful consideration and in full awareness of other options that may have been available to me. I declare that I am an adult in the Commonwealth of Virginia, that I understand the full import of this declaration, and that I am emotionally and mentally competent to give these directions. Signed at ____________________, in the Commonwealth of Virginia, this 20th day of April, 2019. I am not related to _________________________ by blood or marriage and I would not be entitled to any portion of _________________________'s estate on her death. A directive allows you to plan your medical treatment in advance should there ever come a time when you are unable to express your personal health care wishes. A Medical Power of Attorney is a document used to appoint someone to make medical decisions on your behalf. 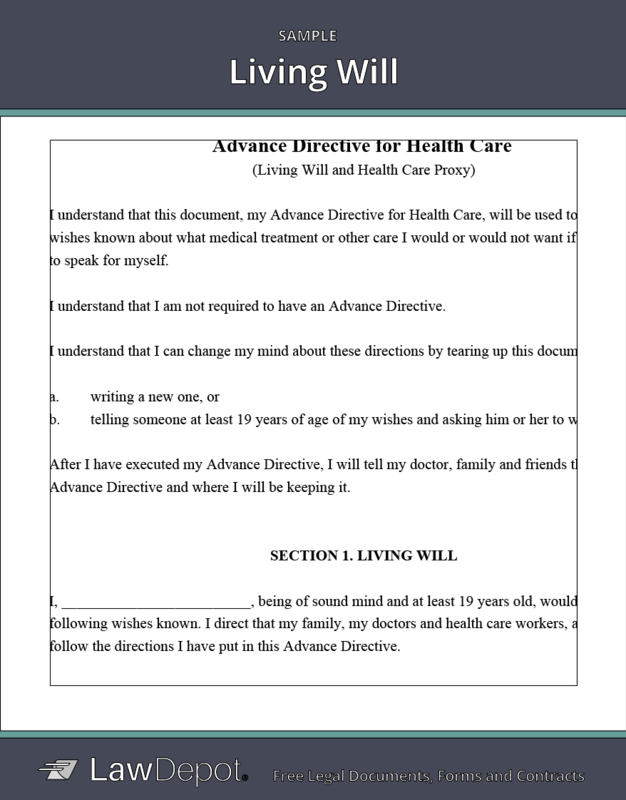 A Living Will is a document that you use to indicate your medical wishes in the event you are incapacitated or cannot consent to your health care treatment. Is a Living Will the same as a Health Care Directive? Some states use the terms Living Will and Health Care Directive interchangeably, and some states use one term but not the other. Generally, a Living Will and a Health Care Directive both dictate your health care preferences in the event of a medical emergency or incapacitation. A Health Care Directive may also be used to refer to a document that contains a Living Will and a Medical Power of Attorney. In addition, different states have varying requirements in what constitutes a Living Will or Health Care Directive. It's important to check your state's laws regarding these documents to determine exactly which documents you need to express your wishes. What is the difference between a Living Will and a Last Will and Testament? If you are unable to express your health care wishes in the future, hospitals and family can reference your Living Will as a statement of your medical wishes. Alternatively, a Last Will and Testament is a document used to indicate how you would like your assets divided or children cared for after your death. You cannot specify medical treatment preferences with a Last Will. Why should I create a Health Care Directive? Without a Health Care Directive, the burden of making your medical decisions falls on your family members. Creating a personal directive not only gives you control of your medical wishes but it saves your family from making tough treatment choices on your behalf. Additionally, implementing a Medical Power of Attorney allows you to discuss your treatment wishes with someone you trust prior to any unforeseen medical circumstance so they can make health care decisions in your best interest. What medical decisions can I make with a Living Will? Every state has its own limits as to what you are legally permitted to include in your directive. While you may specify instructions for a variety of medical situations and describe your feelings towards quality of life, keep in mind health care providers will only be allowed to carry out certain procedures according to your state laws. If you are terminally ill or injured, you can document which, if any, treatment options you would like to pursue. Terminally ill or injured means that medical professionals have concluded that you have a condition that cannot be cured and that is expected to result in limited life expectancy. You can specify whether you would like to receive any form of life support in the event of a medical emergency. Life support means any life-sustaining procedures done to a patient to restore function to an organ through medical intervention. Common forms of life support include CPR (Cardiopulmonary Resuscitation), defibrillators, assisted breathing, dialysis, and artificially administered food and water. DNR stands for "Do Not Resuscitate", which means you do not wish to receive life support or resuscitation if an organ fails. You can address which, if any, treatments you would like to receive in the event of permanent unconsciousness, such as a coma or persistent vegetative state. Permanent unconsciousness is when there is a reasonable degree of medical certainty that the patient can no longer think, feel, knowingly move, or be aware that they are alive, and there is no hope for improvement. You may list your preferences for whether or not you would like to receive comfort care near the end of your life. Comfort care means healthcare professionals will use any means possible to relieve your pain, including administering medication or creating a comfortable environment for you to rest in. In a Living Will, you can define what you personally believe constitutes quality of life in order to inform medical professionals or family members as to what you would want to happen to you in the event of a life or death situation. Quality of life refers to your personal health and comfort standards in relation to a medical emergency or terminal illness. When does my Health Care Directive come into effect? The terms of your directive are binding once you sign the document. It comes into use when you have been found to be incapable of making your own medical decisions. Typically, this may be when you are incapacitated, in a coma, or in a vegetative state. Can I make changes to my Health Care Directive? You can make changes to your personal directive if you destroy your current one, notify your health care representative or hospital of your changes, and create and distribute a new directive. It's important to let everyone in your family know where you keep your advance directive so they can easily find it during an emergency. Personalize your Health Care Directive template.